Picea abies requires warming of both the above- and belowground parts of the tree for full resumption of cambial activity. Elevation-related decrease in growing season temperatures is a highly important factor in limiting tree growth in cold environments such as alpine treeline ecotones. In this study, we aimed to identify radial growth timing differences in Picea abies (L.) Karst. between the lower (timberline) and upper (treeline) parts of an alpine treeline ecotone. 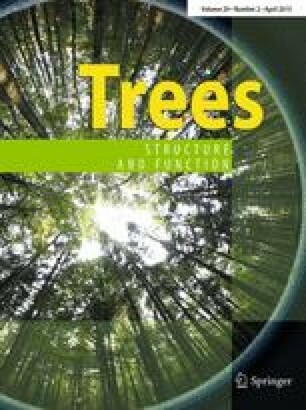 Over three growing seasons, soil and air temperatures were measured and phenology of wood formation was analyzed at two sites separated by 140 m of elevation in the Giant Mountains, Czech Republic. The results showed that there were two periods with significant differences in wood phenology between timberline and treeline. In the early part of the growing season, higher ambient temperatures at timberline led to higher number of cambial and enlarging cells here than at treeline. In the second part of the growing season, the bigger and/or more numerous tracheids at timberline than at treeline required more time for maturation. Significant delay in the beginning of wood formation at treeline in comparison to timberline was observed only in 2011, when soil was frozen markedly longer at treeline. We found that cambial activity significantly increased when soil temperature increased from near zero to a threshold temperature of 4–5 °C. We therefore suggest that for P. abies both the above- and belowground parts of the tree must be sufficiently warm for full resumption of cambial activity. VT coordinated research, collected, analyzed data (2010) and wrote the manuscript; JK and HK collected and analyzed data (2011, 2012); VG discussed results and commented on the manuscript. This study was funded by grant project GACR P504/11/P557. J. Kašpar and H. Kuželová received support by the project SVV 260078/2014 and V. Gryc was supported by the European Social Fund and the state budget of the Czech Republic, Project “Indicators of Trees Vitality Reg. No. CZ.1.07/2.3.00/20.0265”. We appreciate the KRNAP authority for technical support and for permission to conduct research in a protected area. We are grateful to T. Ponocná for laboratory assistance and to J. Rosenthal for improving the English. Furthermore, we thank two anonymous reviewers for their helpful comments.